Long time, no update. Please pardon our dust as we rearrange and clean up the site. 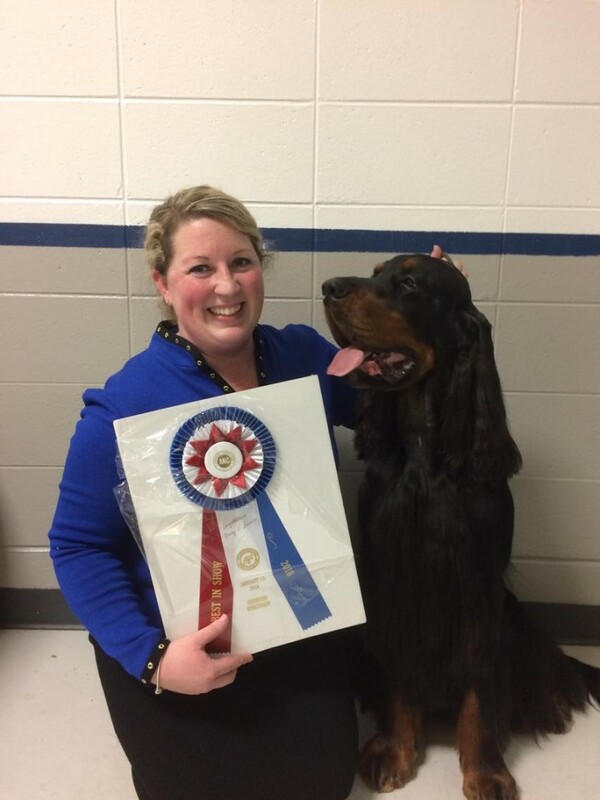 BOOMER: Earns his Grand Championship, his Bronze Grand Championship and ends the year as the #5 Gordon Setter in Breed Points and #7 Gordon Setter in All-Breed Points. He earns an invitation to the prestigious Westminster Kennel Club. DIVA: Became a Champion. She then went on to earn her Grand Champion title at just 3 days over 2 years old. ANGUS: proved that you can teach and old dog new tricks. At 10 1/2 years young, he added a Rally Novice title to his name. MERLIN: continues to beat the odds and turned 15 years old in December. Gotta love the seniors! February 14th 2015 BEST IN SPECIALTY SHOW for Boomer at the Gordon Setter Club Of America Specialty in Rye, NY. January 18th, 2015 – Best of Breed in Wilmington, MA for Boomer. He’s up to 16 GCH points now. January 8, 2015 – Best of Breed for Boomer in Virginia against some strong competition!